After pickup from your hotel for the 9am bus to Nikko, begin your day with a guided tour of the famous Nikko Toshogu Shrine, the mausoleum of the first Tokugawa shogun. Follow your knowledgable guide through the gorgeous complex of more than a dozen Shinto and Buddhist buildings superbly decorated by 17th-century Japanese artisans. Look for the carving of the three wise monkeys that illustrates ‘hear no evil, see no evil, speak no evil’ – the saying originated here! Other highlights include the Yomeimon Gate, the five-storied pagoda, and an ornate karomon gate (an architectural feature symbolizing authority). The entire complex is part of the Shrines and Temples of Nikko, a UNESCO World Heritage site. 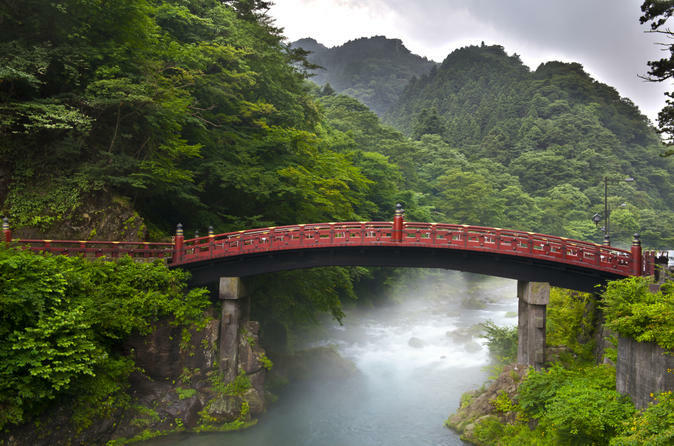 It lies within scenic Nikko National Park, known for its natural beauty and wild monkeys. Bid farewell to your guide after your tour of Toshogu Shrine and continue on your own for lunch (own expense) in Nikko before taking Edo Wonderland's complimentary shuttle to the historical amusement park. Travel back in time to the Edo period (1603-1868) as you walk through Edo Wonderland’s streets, designed to resemble Tokyo in the 17th century. Pass by samurais, ninjas and geishas and join the fun by renting period costumes, or simply snap photos with the costumed actors. Six theaters feature performances of traditional Kabuki theater, ninja and samurai demonstrations, and shadow picture shows – a precursor to today’s popular Japanese anime. After a couple of hours at Edo Wonderland, return to Tokyo by bus and train following the clear instructions provided to you.